Founded in 1882, The Knights of Columbus is a Catholic fraternal organization. It originated in New Haven Connecticut to provide, in part, widows of members with death benefits (Historical note: many insurance companies during the era did not sell policies to Catholic Americans). As of July 1, 2001, the organization had 1.63 million members in 11,860 subordinate councils worldwide. 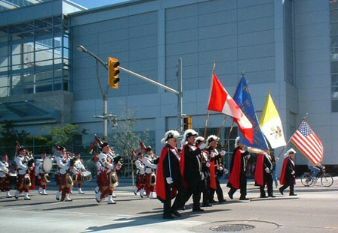 The organizers adopted the name Knights of Columbus in honor of Christopher Columbus. Annual Report, _Columbia_, Volume LXVIII, Number 10, October, 1988. Annual Report, _Columbia_, Volume 81, Number 10, October, 2001. "The Knights of Columbus flag combines in its field, red and white colors from the emblem of the Order, yellow from the papal flag and white and green from the expeditionary flag of Columbus. A broad band of yellow and a narrow band of red, in parallel, divide the flag diagonally from lower left to upper right corners. The triangular white upper field features the green cross of the ensign flown by Christopher Columbus on his voyages of discovery. On the triangular blue lower field is the emblem of the Knights of Columbus." The flag was first hoisted in June, 1988 and measures 3 feet by 5 feet. Indoor and parade quality varieties use gold fringe, cords and tassels. The emblem of the Knights of Columbus features a Maltese-style cross with alternating red and blue arms, upon which is mounted a shield bearing the initials KofC above a depiction of a fasces, sword and anchor. The colors are based upon the colors of the U.S. flag, where the K of C originated. Though the organisation itself is of US origin, the flag that the Knights of Columbus is not only used there but also for its councils in Mexico and in Canada: fel639.tripod.com/KofC9553/38081ee0.jpg. One exception might be for those in Québec. For some reason, the only other flags seen in any of their pictures are the Québec flag alone or with the Canadian and/or the Vatican. 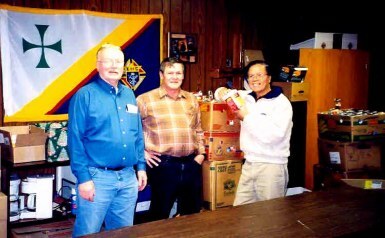 Interestingly, some Canadian KofC councils also use the US national flag: photos.bravenet.com/114/375/028/6/DF0B73D226.jpg. This may be in honour of the organisation's origin. A few also fly the Vatican flag which would stem from the Roman Catholic origins of the organisation. Those councils which are mainly composed of either francophones or hispanophones can use a slightly altered logo, The "K of C" is replaced with "C de C" for "Chevaliers de Colomb" and "Caballeros de Colón" respectively. However, while it seem to be used universalLy by the former, many websites of Hispanic councils use it either with the KofC logo or the last one by itself. As I have not been able to locate an Hispanic council flag, I have no idea how often it is use by them. As the uniform worn by many Asian councils is also, unlike their North American counterpart, white, this might be a case of cultural colour preference in action.